If you’ve been injured in an auto accident, we want you to know that our practice is here for you. 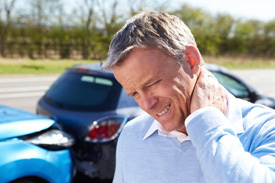 For more than 40 years, Bend chiropractor Dr. McCleery has helped patients recover from car crash injuries naturally and safely with effective chiropractic care. At McCleery Chiropractic Health Centre PC, we understand the trauma an auto accident can cause—both mentally and physically, which is why when you’re in our care, we’ll do everything in our power to treat you like family. It’s our goal that on every visit, you feel like you’re coming home! In the state of Oregon, it’s easy to get the help your body needs following an auto accident. With years of experience helping patients across central Oregon through personal, custom care, Dr. McCleery knows a few things about what you should do next. Auto accident insurance covers individuals who have been injured in a motor vehicle accident without the need for a referral from a primary care physician—that means you can elect to receive care from any chiropractor you wish. You have up to two years following the accident to seek care for your injury. That means if you’re still dealing with the repercussions of whiplash from an accident less than two years ago, you can schedule an appointment to be seen by our practice as early as tomorrow. Auto accident policies typically cover 100% of medically necessary treatments up to the limits of your insurance. We’re happy to let you know that includes chiropractic care! If you’re ready to join our chiropractic family, we’d love to have you! Over the years, Dr. McCleery has treated thousands of patients who’ve been injured in auto accidents. When the body goes through this kind of trauma, it can go into spasms that can cause disturbances to spread throughout your nervous system. The longer you wait to remove interference, the worse your pain or injury can get. Dr. McCleery can help your body release the spasms and recover without the need for drugs or surgery. If you have a medical team you’d like us to work with, we’re happy to take a multi-disciplinary approach to your care—our number one goal is getting you better as quickly and safely as possible. We truly want the best for our patients every step of the way! When you choose us for your care, we’ll never treat you as just a number. To us, you’re family! The sooner you seek treatment with us, the sooner we’re able to get you better and back to your life. Contact our practice today to learn how we can help you—schedule your 15-minute complimentary consultation today!